Today is not over, but I thought I would post DAY IN MALAYSIA and do sequels later. So, I decided to begin my morning by freaking myself out. This is my sweet spot really, working myself into a “worst case scenario” lather. And, I was in the zone this morning…big time. I read on the internets that the scam artists and pick pockets prey on tourists. They look for people with cameras and backpacks and make a bee line for them. So, as I began preparing to go out for the day, I began checking out the gear I am planning to haul around the city…basically, a camera and a small backpack. I fretted over the large lens on the camera I brought and the fact that I have no idea how to hide it other than in a backpack. I thought about maybe going a full day in this country, my only one, without a camera so that I would not stand out so much. Then I laughed and laughed and laughed. I could not stand out more if I dressed like the Statue of Liberty and wore the American flag like a cape. Even in an anglo country, I look quintessentially American. The camera and backpack are the least of my worries. I decided to really go nuts and try to get my way around on the KL train network (Light Rail Train or LRT). At this point, I have only been in the country twelve hours and I am tired of being told by everyone that I have to pay a taxi driver the equivalent of twenty American dollars for a ten minute cab ride. I decide to hoof it. As I got to the train station, I saw two men in full camo fatigue uniforms, carrying bagpipes. They looked incredibly tough…desert boots and all…and they were carrying bagpipes. They were a little scary looking, even with the bagpipes, so I fixed the settings on my camera and tried to catch up with them. Every time they would look around, I would pretend I was fascinated with the Hello Kitty watch selection, or the extensive Indian CD choices available in the market. Finally I was in the perfect position to shoot a few inconspicuous pics… and that is when I realized that I had left my camera’s memory card in my computer. And this is why you do not have a picture of those guys. This is my saddest moment of the day. Which is pretty cool actually. After retrieving my card from the hotel, I headed for the Petronus Twin Towers (which are in the KL Convention Center area, or KLCC). The towers are like the second or maybe third tallest something, something blah blah blah in the world…something like that. These things are on every t-shirt in town and I did not see a single souvenir shop anywhere that did not prominently feature a selection of Petronus Tower statuary. There is a bridge that connects them that you have to get a ticket to go up and see and it is supposed to be a really incredible view. I didn’t end up going. The Petronus Towers house a pretty shi shi shopping mall. Somewhere in that maze of Chanel, Tiffany and Bvlgari…I lost my will to live and left the premises without ever having found the elusive ticket counter. Hey, I saw ‘em. That’s enough. 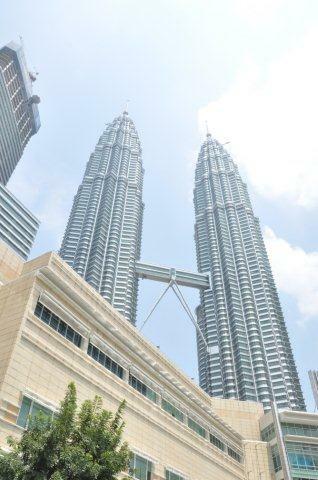 Are the Petronus Twin Towers named after the petronus in Harry Potter? You know the stag that Harry can cast from his wand in order to get help. Everyone has their own petronus.